Plot: Post-war Chicago's inhabitants are divided into five groups, each assigned with a specific task to help the others. Tris, a Divergent that doesn't fit into the system, finds herself on the run from a sinister government that wants all Divergents dead. 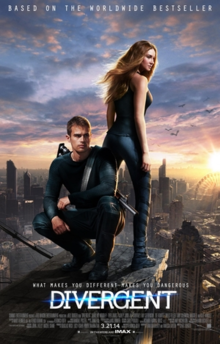 DIVERGENT is a perfect example of a good book being made into a very good movie. I would put it on par with THE HUNGER GAMES and significantly better than THE MORTAL INSTRUMENTS: CITY OF BONES. It has great moments of suspense and intensity, the world building is top notch, and Tris's arc is played out very well. If I had to say anything bad about the movie it's that Peter, Will and Al look so similar, if you didn't read the book you may have trouble telling them apart. Also, there are a couple of plot holes that will drive detail-oriented viewers crazy. Fans of the book will really enjoy the movie as will fans of the dystopian young adult genre. Adults should not skip this movie thinking it's just another teen movie, it is definitely worth a watch. FUN FACT: Be on the lookout for a Veronica Roth cameo. She shows up as a Dauntless. Plot: During a world tour Kermit and the gang get mixed up in a jewelry heist orchestrated by a Kermit look alike. 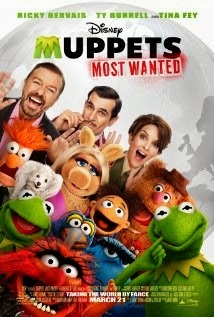 MUPPETS MOST WANTED is exactly what you expect from a Muppet movie. Not much of a plot, not overly funny, but a lot of good music, good cameos by several of Hollywood’s hottest stars, and enough humor to make the movie enjoyable for kids and tolerable for adults. If you’ve got the money to spend at the theater, this would be a good treat for the younger kids, but you won’t miss out on anything if you just wait for the DVD.